Lamia Classic is located inside the ancient estate Trulli Anna, a beautiful complex of trulli and Lamie, which stands in 1882 among the beautiful countryside located between Cisternino and Ostuni, surrounded by pine forests and immense valleys and immersed in the enchanting flora of Puglia, in one of the most intimate and evocative of the whole Valle d'Itria. The entire villa has been recently renovated with extreme attention to detail. The accommodation - Lamia Classic, as well as the entire villa, has been recently renovated, furnished with taste and chromatic harmony, respecting the concepts of comfort and relaxation to guarantee an unforgettable experience at any time of the year. Lamia Classic is a typical Apulian lamia, tastefully furnished with respect for the original and characteristic style of the ancient rural dwellings of Valle d'Itria. The spaces are well distributed and treated in the smallest detail in order to maintain the right balance between antique taste and latest generation design. All this makes Lamia Classic the ideal choice for a couple's holiday in the name of relaxation and privacy all year round. 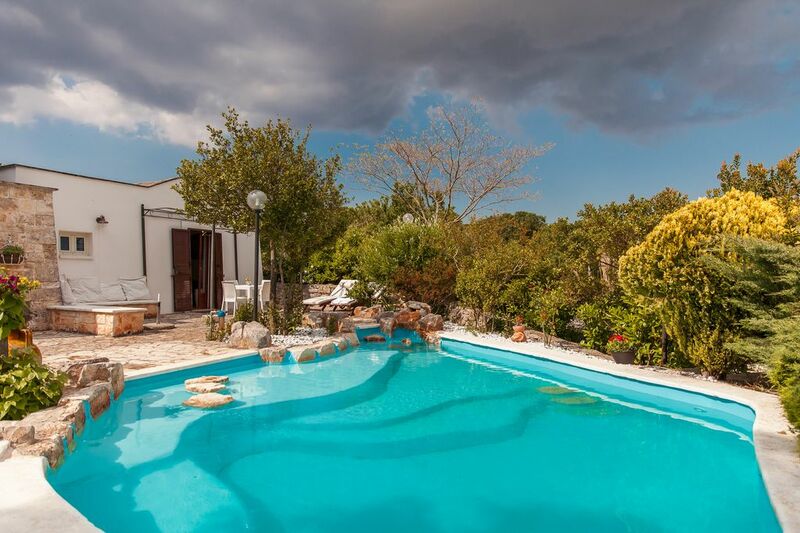 You can choose between the romantic atmosphere created by an ancient Apulian home in the winter and the relaxation of a wonderful swimming pool in the summer. Among the perfumes and long walks in spring and the bright and intriguing colors of the autumn forest. The pool is surrounded by strong and lush nature and overlooked by the imposing presence of ancient structures. The outdoor area and the outdoor living area open onto a wonderful scenario dominated by the green of the olive trees. The hectares of orchards and olive groves that surround the estate are the ideal place to rediscover yourself and get away from the routine of city life. Trulli Anna is a gift to be given to oneself, to dedicate time and recover energies. It is a happy oasis able to give its guests unique and unforgettable moments. The Lamia Classic is a gem of Apulian architecture ideal for couples looking for a luxurious holiday in respect of their privacy. A marvelous barrel vault above the functional and well-furnished rooms, respectful, in the style of furnishing, of that much sought-after typical Pugliese style. The kitchenette is studied in detail to optimize the space and make it comfortable and enjoyable use. It is well equipped and equipped with all utensils and crockery. Interaction with guests - We love to pamper our guests trying to satisfy any kind of need. We will be ready to give you advice to make your experience in Puglia unique, indicating the most interesting tourist destinations, the most beautiful beaches to explore and the most enjoyable activities to do during your stay. There will also be a nice welcome gift for you. • During the winter months, only at the request of the customer, the heating system can be activated at a cost of 15 euros per day. • The swimming pool will be available from the month of May and is equipped with a heating system able to increase the water temperature by 4-5 degrees compared to the outside temperature. The opening period of the pool may change due to weather. • Lamia Classic is one of the three units in the Trulli Anna estate. Nearby - Trulli Anna is the ideal starting point for your holiday in Puglia. It is immersed in a wonderful countryside, rich in scents and colors. The whiteness of the Apulian stone, the green foliage of the olive trees and the warmth of the red earth embrace the clear notes of rosemary and sweet figs, of myrtle and citrus, of thyme and wild herbs, of blackberries and stone, which will move in the air carried by a warm sirocco wind. We are just a few kilometers from Cisternino and Ostuni, in a literally breathtaking scenery. From here you can reach the cities of Fasano, Locorotondo, Martina Franca, Alberobello. You can walk the Ciclovia dell'Acqua, a 30 km cycle path that winds its way between the tracks and the neighboring districts or spend your days among evocative clearings and pastures, in the company of solitary reading and meditation or for an informal outdoor walk with the family. The most beautiful beaches of Puglia and the equipped beaches are located just over twenty minutes from the estate. Miles and miles of pristine beaches and natural marine reserves, sometimes covered by Mediterranean vegetation, will unleash the essence of Puglia leaving you literally breathless. Getting around - Trulli Anna is immersed in the green countryside of Cisternino. It will therefore be essential to have a car to reach the nearby cities. Parking will be available free of charge for the duration of the stay. To make the most of the immense beauty of the Apulian flora and fauna, of which the surrounding area is rich, we recommend beautiful walks by bike (you will find some at your disposal for free) or on foot. The Valle d'Itria is an enchanted place to spend your holidays. The activities and tourist attractions are many. This is an enogastronomic journey, which can be experienced both in the alleys of the ancient and characteristic Apulian villages to be discovered and on the golden beaches of the Apulian coast.